Swite is a new website we have recently discovered through Product Hunt. 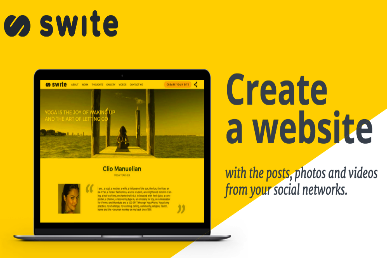 Swite provides you with a simple and intuitive platform to create a website with the content (e.g posts, photos and videos) you share on your social media accounts such as Facebook, Twitter, Google Plus and Instagram. Your Swite website is automatically synchronized with your social media networks and updates itself every time you post new content. As a teacher, you can use Swite for a variety of educational purposes including: curating digital content for your class, use it as a digital portfolio to showcase what you have been sharing and many more. The process to build a Swite website is very easy: First you login through one of your social media accounts (Twitter, Facebook, Instagram or Google Plus). Next, select a template for your website. There are actually several beautiful pre-designed templates to choose from. After you pick a theme, type in the name of your Swite site and use a valid email address to access your site’s editor. From there you can choose which of your social media profiles you want to connect. Click on ‘Social connect’ on the left side to add a social profile. Once added Swite starts importing content you have shared there and anything you share in the future will also be instantly displayed on your Swite site. The free version of Swite allows you to do all the things we have talked about so far, however, if you want more functionalities ( no Swite brand, a customized domain name, 3 email 5GB) you need to go pro.